With the promise of Spring, it is a good time to take a look around your home and begin to plan your interior projects that you are looking at completing throughout the year. Some projects that you are dreaming about can take some time to put together. It’s why I encourage you to start your thought process, gather photos of what you are wanting your project to look like completed, and then pick up the phone and schedule an appointment for a professional to come in and assist you in your project. We stand ready to assist you! Major cottage renovation in Boothbay, Maine. Twenty four years is a long time! So wrapping my head around the fact that I have been in business that long is hard to comprehend. When I think about everything that has transpired during that time, it looks like it should be 100 years. I’ll spare you all those details! I believe the single most significant decision I can make on a day to day basis is “my choice of attitude”. It is more important than my past, my education, my bankroll, my successes or failures, fame or pain, what other people think about me, or say about me, my circumstances or my position. Attitude is that “single string” that keeps me going or cripples my progress. It alone fuels my fire or assaults my hope. When my attitudes are right there’s no barrier too high, no valley too deep, no dream too extreme, no challenge too great for me. So my friends, thank you for your support and allowing me to “define your perfect living space”. I’d like to say that there will be 24 more years, but I know that not to be true. What is true is I will continue to do until I can’t. Yesterday I had the privilege of attending a social media seminar put on by SCORE in Lancaster. For those of you who aren't familiar with SCORE, it is an organization of retired business folks who want to give back to small business. The presenter talked about blogging, and the importance of it along with other social media trends. She mentioned that it is usually done by those who are experts in their fields. Which got me thinking, what makes an expert? I'd like to think that having served in the interior design community for the past 34 years has certainly made me an expert, right? I don't know. I know a lot of "stuff" about color, design, construction, furniture, window treatments, but have I become an expert in it or do I just know a lot? My goal is to blog more often, keep you all informed about trends, and share my knowledge of design. I'll let you all be the judge on my expert status. Thanks for reading, and remember to look around your home and make it the best environment you can for you and your family. Memorial Day marked the unofficial start of summer. Here are some tips to get in the spirit by transforming your indoor and outdoor spaces. When we think summer, we think colors! Bright hues can really transform a space and add a summer feel. Add graphic paintings, fresh flowers or try hanging vibrant plates for a quick and easy transformation. Just because it won’t be used in the traditional sense this season, doesn’t mean it can’t be a focal point. Try artfully stacking leftover wood or display an array of interesting candles. Even tea lights in multiples can make a beautiful display of light. If you’re going for a coastal look, try adding large pieces of coral, starfish, and shells. In a previous blog, we discussed ways to bring the outdoors in, but have you considered ways to bring the indoors out? Try taking some light furniture outdoors for outdoor entertaining and picnics. It doesn’t have to stay outdoors all season but is a great and comfy way to make your yard really feel like a livable space. Add some easy, natural touches to your coffee tables and bedside nooks. Try incorporating natural decor like a bouquet of flowers from your garden or beach-combing treasures you’ve collected. Fruit and produce arranged in a bowl also add lovely touches of nature. Unifying a ragtag patio set is as easy as grabbing a bucket of paint or stain. If your patio set isn’t looking as inviting as you’d like, try adding new cushions, recovering your old cushions, painting or staining the bases. Fresh cushions or pillows can change up an entire room and make it feel fresh! Simply adding some colorful pillows will make you feel like you’ve made a big change without much effort. Spring has sprung! Well, it has officially arrived anyway. It’s time to get out and do some spring cleaning! Don’t forget, outdoor spaces are aesthetically just as important as the indoors. Here are some things to add to your weekend to-do lists to make sure you that by the time the snow melts, you’ll be ready to enjoy your outdoor space! · Feed the lawn: Sprinkle the yard with a nitrogen-heavy fertilizer as soon as the snow melts to get the grass ready to look its best. · Get rid of the weeds: April showers bring May flowers, but they also bring weeds. Make sure your garden is looking its best by clearing out overgrowth so that your blossoms will stand out. 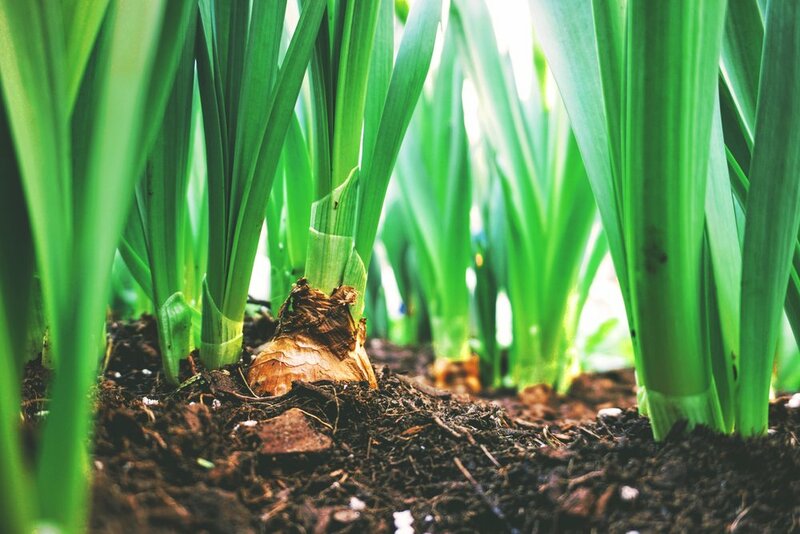 · Plant bulbs: If you forgot to plant bulbs last fall, or if you just want to get a head start on summer gardening, spring is the perfect time to plant your favorite flowers! · Clean out the gutters: As the rainy season rolls in, it’s time to make sure your gutters are free of debris. Ignoring them could lead to major problems down the road like basement flooding, rotting wood, or foundation damage from all the water that can’t properly drain. · Trim the trees: In early spring, before the trees start to bloom, is the best time to prune plants that are dormant during winter. Lastly, get out there and enjoy your beautiful outdoor space! Have you ever wondered what it’s like inside the minds of interior designers? Well, we can’t speak for all of them, but here at a Room with a view, it’s colorful in there! Our thoughts are full of, patterns, shapes, colors, textures, lines, lighting, form and function. We’re thinking about traffic patterns in your home, how you’ll use your space, seasonality, and taking many other things into consideration. This season’s window reflects this thought progression. We explored what the design process actually looks like for us as we start to pull together wallpaper, floral touches, fabrics, trims, furniture, paint, accessories, etc. 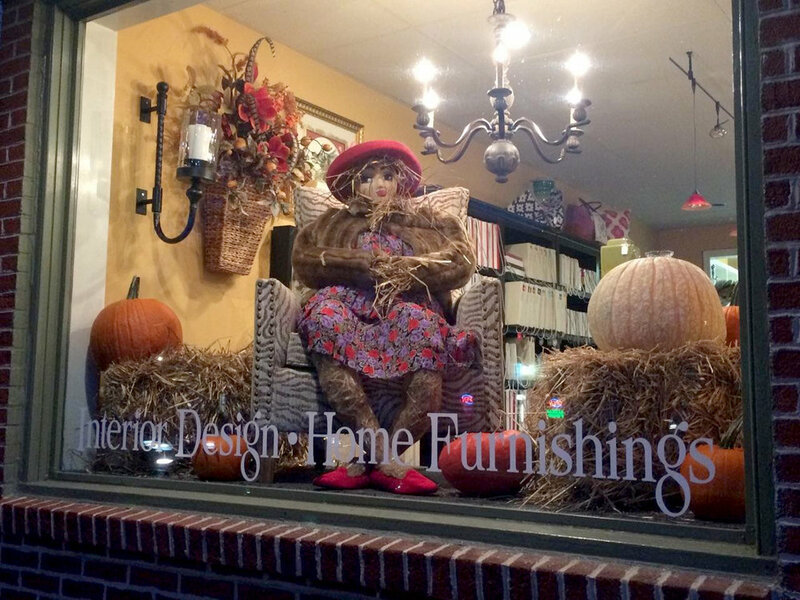 In our second window you can see our designer scarecrow, Mable, overseeing the project. She thinks it’s really coming together! It’s been a hot and humid summer here in Pennsylvania, and nothing makes that more bearable than a nice, cool drink. After reading our last blog, you probably stocked up your home bar and now have bottles and supplies just hanging out on your counter and you’re wondering how to make it all look pretty. Sorry to keep you hanging; summer has just been flying by! There is no shortage of ways you can put together an aesthetically pleasing bar. Some opt for a true bar look with a counter and stools. Builders can create custom bars for indoor or outdoor use. If you entertain often, this is a great choice! There are many things to consider when designing a bar (like what type of stone, sinks, paint colors to pick, etc), so be sure to consult your decorator on the best options for your space. If this is a little much for you, or you lack the space, consider a bar cart. This is a great option because it looks great and keeps everything together, but can be rolled away and tucked out of sight if needed. If it’s a well-styled cart, it can also be kept out and used to enhance your décor. Bar accessories added to a pretty ceramic dish make an eye catching display on this bar cart. Many people repurpose things into home bars. You can find tutorials online on how to transform everything from dressers and old suitcases to barrels and even an old pianos into a mini bar. If you're looking for a good DIY project, this is it. Another great option is just to add a few decorative touches to an existing piece. Try adding a tray and some decanters to the top of a dresser or cabinet. Bottles can then be tucked inside to give it a tidy appearance. Don't be afraid to add a few decorative touches like framed artwork, cigar boxes, vases, or anything that will pair well with your bar accessories. Alright, everybody gather ‘round. I’m going to tell you the secrets of stocking your home bar so you can impress your dates, clients, boss, friends, neighbors, or anyone with whom you want to share a drink. You don’t need to spend a small fortune or take up a lot of room in your home to be a super-suave host; you just need to have the basics. And don’t forget to stock up on ice! Not having ice would be a major party foul. You’re so close to being the perfect host; don’t ruin it by serving your drinks in a red Solo cup. You can keep it very simple by just having short glasses, tall glasses and stems. If you really want to pull out all the stops, pick up some wine glasses, martini glasses and beer mugs or pint glasses. Stemless crystal glasses are also becoming increasingly popular. And please don’t forget about your designated drivers. No one should feel punished for refraining from alcohol. Make them something fancy! Sprite is not fancy. Water with lemon is not fancy. Mix them up something fun, put it in a nifty glass, and don’t forget to garnish it! Now go to the liquor store and stock your bar! The next blog will cover home bar storage. I’ll tell you how to make your bar practical, fun, and sophisticated… this is a design blog after all! To be, or not to be: that is the question. More specifically, to be a rug-in-the-dining-room person or not, is the question. Which are you? There is no right or wrong answer to this question, but people on either side of this age-old debate might have you believe otherwise. There are pretty convincing arguments on both sides. Pro-rug people argue that a room just doesn’t look finished without a rug. Rugs not only protect your floors, but they add visual interest and are a great way to add a little pattern, color, and texture into your dining room. They’ll tell you that a rug will help define the space (especially in an open concept floor plan). Well… they aren’t wrong. But the anti-ruggers make equally good points. Rugs are a big investment and if your lifestyle isn’t currently conducive to having an area rug in your dining room, it would be a waste of money. Chairs catch on rugs, babies and kids (and clumsy adults) spill on rugs, and pets do… well, pets do ALL kinds of bad things to them. Rugs also collect dust and allergens and do need to be vacuumed and cleaned. If you’re in the season of life where kids and pets are roaming free, this might not be the best time for you to have an area rug and that’s ok! If you do feel like now is the time, however, make sure you find a rug that makes sense for your dining area. There are many things to consider when purchasing a rug, but more on that later. And when in doubt, call your decorator! Room with a View is happy to help you pick the perfect rug for your dining area. We can order these and many other beautiful patterns to suit your space. Adding plants to your décor is a great way to bring nature inside. Adding flowers will let you get a whiff of spring and some house plants even help purify the air. If you have a green thumb, the sky’s the limit! You can add plants to fun pots or unusual containers and experiment with placing them in different rooms of your home. If however, your plants flop over and die merely by being in your presence, then you can opt for some safer, hardier options. Succulents (cacti, aloe, etc) are fairly easy to care for and require little attention. If you fear you’ll even kill those (been there, done that), you could try a faux arrangement. Here is an example of a live house plant. This is a wonderful silk arrangement. Best of all, it's impossible to kill! Bringing animals into your home definitely adds a sense of nature. Live animals such as birds, fish, and reptiles can make you feel like you’re part of the outdoors while sitting in your living room. Pets require time and attention though, so if you aren’t able to give them the proper care they deserve, you can just incorporate animal-like elements into your decor. Animal print is a fun and easy way to accomplish this. You can also consider wallpaper, works of art, sculpture and even clawfoot furnishings. These metal bunnies add a touch of nature's whimsy indoors. Something as simple as having a bowl of fruit or vegetables in your home can help give it an organic feel. Artists have been inspired by this concept for thousands of years. Just think of all the still life paintings in museums showcasing bowls of produce. Fruit is beautiful and is often found decorating kitchen counters and tables, but don’t forget about your veggies. Instead of hiding those gorgeous beets from the farmer’s market in your fridge, try using them as décor before turning them into dinner. Peppers are lovely also, and a great way to add pops of color. Lemons add such a nice pop of color. Few things are more soothing than the sound of water. Adding a water feature can really bring a sense of calm. Small fountains are a great way to do this. If that’s not an option for you, you could try a replica of water. Try framing a picture from a trip to the beach. You can almost smell that salt-kissed air! An ocean painting would also do the trick, or some cleverly displayed seashells and sea creatures. If salt water isn’t your thing, perhaps a picture of a lake would work for you. You can almost feel the sand between your toes while gazing at this bowl of shells. You can almost make a room fade into the outdoors with your use of color. Look out your windows and notice the natural colors around you. See that row of tulips in your windowbox? Try adding some throw pillows in the same colors. Do you like that tree that just bloomed? Try pulling shades of green indoors with baskets with ferns, dried pods, and other green accents. Be inspired by your view and before you know it, you’ll feel like you’re sitting outside… but without all the bugs. Notice the subtle touches of green using striped candles and dried seed pods. Your home is where you live, but do you want your home to look lived in? In decades past, decorating had strict rules and homes had formal rooms. It was common to have formal sitting rooms that were scarcely or never touched. Lately formality seems to be giving way to functionality, however. Parlors have become “man caves” and formal sitting rooms are often craft rooms, play rooms, or offices. The small house movement is in full swing with people choosing houses under 1,000 square feet. Some are taking it even further, by moving into tiny houses, which have fewer than 400 square feet. With people choosing smaller and often less formal spaces, does this mean that decorating has gone by the wayside? On the contrary, this shift has led to even more conscious decorating. Instead of filling their houses with many pieces, people are often selecting fewer, but more meaningful pieces of art and memorabilia. As some opt for smaller spaces, space planning and decorating become even more important. We all want to come home to a space that welcomes us and feels like home, no matter the size, how formal or how “lived in. This antique Swedish linen cabinet was carefully chosen for this small sitting room. When closed, it serves as a lovely statement piece and when opened it reveals a TV, remotes, DVDs and player and also serves as a bar. In smaller spaces, it's important to find pieces that can serve multiple purposes. What is it about our dogs that make us want to share them with the world? Many of our manufacturer’s catalogs and websites feature pictures of their dogs. Every time I open one of these catalogs, I instantly feel a connection to the items they feature. I also instantly feel at home with the catalog and magazine articles that picture dogs. There is this life, safety, and love they bring to our homes. Although children also conjure up some of these same feelings, it’s different with our four-legged family members. Throughout history we have had constant companionship from these lovable creatures. National Puppy Day was last week, and it got me thinking about what is it that sparks that sense of belonging. Love and enjoy your dogs! How do you feel when you look at these photos from our Thibaut wallpaper books? 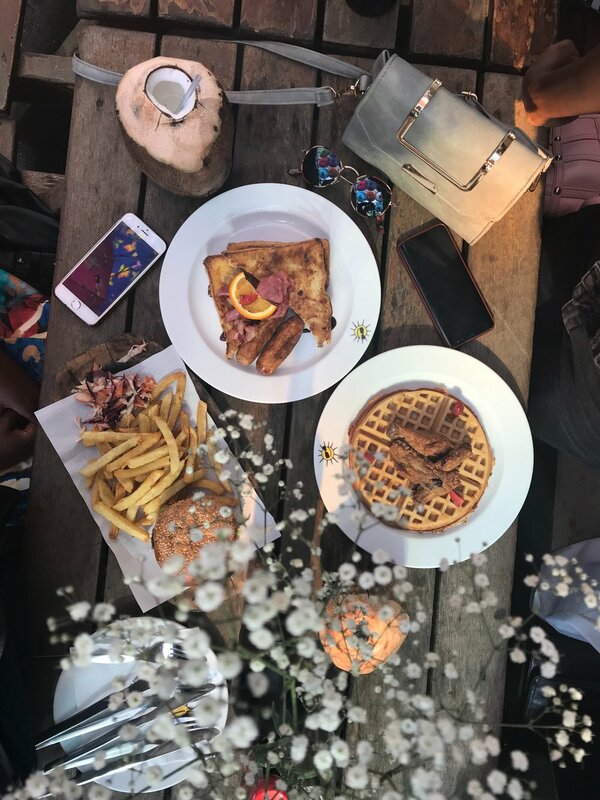 Are you also able to instantly connect with these spaces? Yesterday was National Dog Day. It was a difficult day, to say the least, because I lost my daily companion this past January. Although he was only 4, he had spent the past 4 years by my side day and night. Whether he was laying in my office listening to my fingers on the keyboard, which inevitably put him to sleep, or someone walking in the front door which caused him to run circles in the shop due to his excitement that we had company, he was always content. He taught me a lot during his tenure as my companion and assistant. He probably taught me more while he was fighting for his life with a terminal illness. You see, he couldn't complain, he couldn't tell us how he was feeling. He only trusted that we would take care of his needs. So I continue to adjust to his absence, and miss him every day. ...to help design a website. So, I "thought" I understood how to connect everything in the behind the scenes of a website. Apparently, I didn't. So I will try again to publish a Blog to your email. My apologies!! It also takes a village, or at least an architect (or two), an interior designer, and very skilled tradesmen to get a house of this caliber off the ground. We are excited to be part of this project. We have been working with Jack Arnold, a world renowned architect, on this project for a few years now. If you want to see what this home has the potential to be, check out his website www.jackarnold.com. His homes and designs are high style. This is a quick sketch on his original concept. The first order of business is the stucco color, window color, stone, and roofing. After that, we will begin to work on the kitchen and it's layout and selections. This drawing could be a great start. I know that I am dating myself, but do you remember spring house cleaning? If you do remember, you know what I'm talking about when I say it was exhausting. But the reward was so great!! Everything looked and smelled fresh. Here are some fresh new looks from Anna French, a division of Thibaut Wallcoverings and a company that we carry that specializes in both fabric and wallpaper. Wallpaper is making a big comeback. It adds dimension, color, texture, and interest that you can't get with paint. If you are thinking about giving a room some interest, consider wallpaper. Is it an investment, yes! But is it worth it? Absolutely! Is it time to "Spring Clean" your look? These great ideas are making me look around my own home. Go ahead...add a little color in your home! Ever wonder why you become relaxed and calm when you are at the beach? Of course the sound of the waves, sea galls, and the heat of the sun play an important part. But, have you ever considered the colors around you? Maybe it's the changing of the seasons, another birthday, or our hurried lifestyle, but I look forward to the slower pace that comes with summer, and the color changes that come this time of year. The 2016-2017 Global Color and Design Trends "Odyssey" booklet has come out. The colors around the beach are termed their "Calming Colors". Want to be inspired with color for your home? Check out www.ppg.com. Their booklet will give you ideas on what colors to use in your home depending on what you are trying to evoke. Have fun with color! Would love to hear from you and what you discover!